The Details: Take a shoujo series like Sailor Moon, load it with as much cuteness as anyone can stand, and then suddenly say hee hee hee and make it a lot more creepy. Hey, it works! 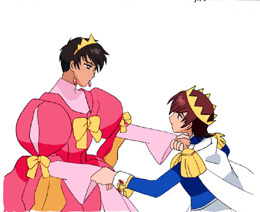 I adore Clamp series, though Tokyo Babylon and X are my favourites. Having been djka they have a way of working in so many things that people typically need to, well, read doujinshi for. 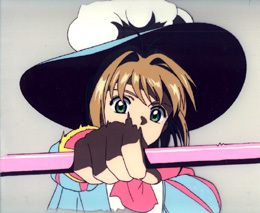 This is one of those rare series where I actually collect cels of, *gasp*, the lead character! Yes, I have Sakura in various poses and battle outfits. But I also collect Li (too adorable! ), Yue (too... something! ), Keroberos, and a bit of Meilin, Tomoyo, Touya, & Yukito. Plus whatever Cards and Eriol I can afford while pining away over the elusive perfect Clow Reed cel. I finally added a Supi & Kero sub-section! And now an Others page as well, currently its sole resident is Mizuki Kaho.